T-Sign Backdrop Banner Stands are a perfect display solution when you need a stand to hold a large size banner or when you really need a professional presentation to show off your company at any venue, media event, tradeshow or for Photobooth background. Our telescopic banner stand is durable, adjustable, and most importantly, massive! The whole stand is heavy duty, durable, easy to transport with an soft carrying case, We use the strong aluminum material to Against the wind, It will be your good partners at the tradeshow! Maximum visible graphic size: 96"x96"
T-Sign is a professional manufacturer of high quality sign stand, We have twenty years of experience in this industry, produced hundreds of thousands of stand products every month, from poster stands, banner stands, magazine stands, backdrop stands and X display, etc. Each of our products is carefully manufactured and rigorously tested before selling. T-Sign wants to keep bringing best quality stands to customers all over the world! Not just talking about it, we'll stick to it! 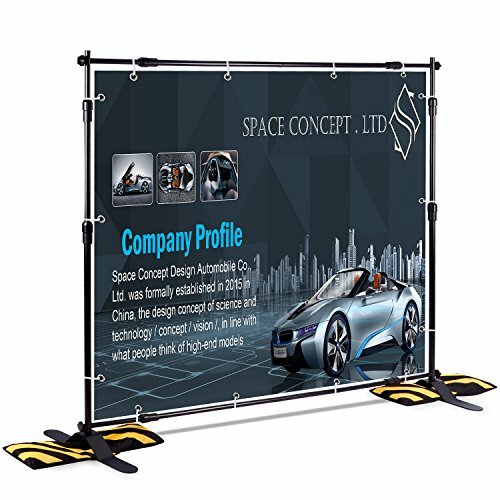 Adjustable Size: From 54" to 96" wide and 36" to 96" height, Maximum visible graphics size is 96"x96"